ECHINODERMATA : PAXILLOSIDA : Luidiidae STARFISH, SEA URCHINS, ETC. 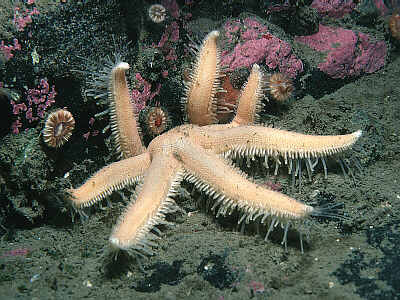 Description: This starfish normally has seven arms. The body and arms have an even velvety texture and are orange-brown in colour. There is a conspicuous band of long white spines along each side of the arms. The tube feet are very long and tapering and the starfish can move very quickly. Up to 40cm or more in some localities. 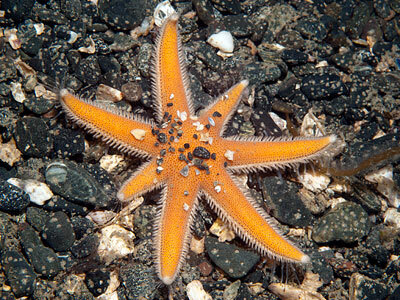 Habitat: Found on sandy or sand scoured rock, gravel and mixed sediments where it feeds on other Echinoderms. It may be found from the lower shore to deep water. Individuals often bury themselves partly in gravel. Distribution: South and west coasts of the British Isles as far north as the Shetlands and possibly on the east coast. Similar Species: Luidia sarsi is similar but unlikely to be confused as it only has five arms. Large white marginal spines in groups of four or five. Picton, B.E. & Morrow, C.C. (2016). Luidia ciliaris (Philippi, 1837). [In] Encyclopedia of Marine Life of Britain and Ireland.